In the middle of the vast Pacific Ocean lies the most remote archipelago on the planet . . . Hawaii, the quintessential tropical paradise. When traveling there, you will experience the most amazing beaches, tropical rain forests, cultural activities and restaurants. But what is Hawaiian food and where do you get it? That is a difficult question as Hawaii is a melting pot of many cultures. Most people’s first experience with the Hawaiian cuisine is at a commercial luau. (TIP: To find one while in Hawaii, check out: This Week Hawaii (http://thisweekhawaii.com/) or Spotlight Hawaii Publishing (http://www.spotlighthawaii.com/). These are the free magazines with coupons that you can pick up at the airport or tourist locations.) But commercial luaus are just that, the food is made for the large crowds that attend. So where does one find authentic Hawaiian food? One could say that the Hawaiian plate lunch is Hawaiian food and they would be correct to an extent. You can find plate lunches at many restaurants and roadside food trucks. Plate lunch is two scoops of white rice, one scoop of macaroni salad and some super flavorful Hawaiian delight such as Kalua Pork (pig cooked in an Imu pit…amazing), Loco Moco (beef patty with egg on top), garlic shrimp, etc. Plate lunches derived from immigrants sharing lunches while working on the sugar plantations. It has become a staple of daily life in Hawaii. While it is Hawaiian cuisine, it is not traditional fare. One of the best places to find traditional Hawaiian food, in a non-luau setting, is at Helena’s Hawaiian Food (http://helenashawaiianfood.com), 1240 North School St. in downtown Honolulu. This is a no nonsense, local and foodie restaurant. The only way to get this kind of authenticity is if you are eating at your Hawaiian auntie’s house. If you go there during peak hours, you should expect to wait for a table. Be patient, it is beyond worth the wait. The menu is a compilation of unbelievable traditional Hawaiian fare. They have the famous Kalua Pig, Laulau (pork and/or fish wrapped in taro leaves), amazing stews, Luau squid or chicken (cooked in coconut milk), Lomi Lomi, unbelievable seafood and much more. But, when you go to Helena’s, you absolutely cannot miss their world renowned Short Ribs Pipikaula Style. This dish is so good, it has been featured on two TV cooking and travel shows and is a winner of the prestigious James Beard Award. The Short Ribs Pipikaula Style are strips of beef short ribs which are hung and dry aged. They are then cut up to bite sized pieces and cooked to order. 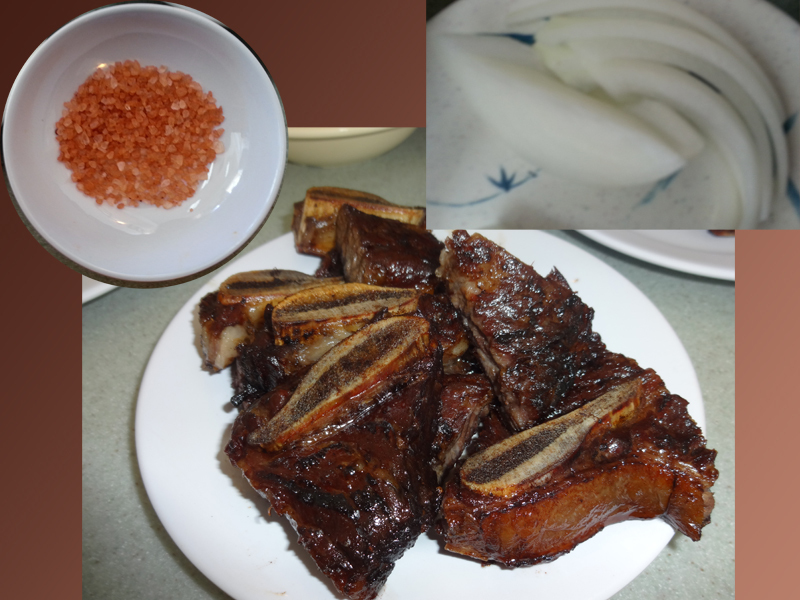 While the Pipikaula Short Ribs are not to be missed, there is a proper way to eat them to enhance their succulent flavor. Sure, you could pick them up and devour them as is and would not be the slightest bit disappointed. But there are extras that come with this dish that should not be ignored. When you order these wondrous morsels they are served with a small bowl of sliced Maui onions and another small bowl of Hawaiian sea salt. Each piece of meat still has the bone in, but it is a small cross section of the longer rib bone. It is just the right size for picking up and eating around the bone. The meat is meant to be eaten with a small piece of the Maui onion and a little sprinkling of the Hawaiian sea salt. The way you do this is entirely up to you. Personally, I dip the onion piece into the salt catching a few granules and then putting in onto the meat I am about to bite. I have seen people lick the meat, dip it into the salt and then pop a slice of onion in their mouths before they bit the meat. Again, you can add your own flare to this. The meat has a very rich flavor that is enhanced by the Hawaiian sea salt. The Maui onion provides a sweet and pungent contrast to the beef. The combination of these flavors makes the beef flavor explode in your mouth. You are left salivating waiting for your next bite. I have to make a comment about an underappreciated menu item, Poi. When newbies first encounter it, usually at their first luau, they think it is a Hawaiian joke to get mainlanders to eat it. But, I assure you it is not, they just do not know how to eat it. Poi was and is the starch staple on the islands. When eaten straight up it has no immediate appeal and is an acquired taste. But, that is not how Hawaiians generally eat it. Many Hawaiian dishes are highly flavored or extremely rich in flavor. When you take these powerful proteins and dip them into the poi it tames the flavors down a bit. Let’s say you are not a fish eater but are over a friend’s house and that is what they are serving. If you dip the fish in the poi, it reduces the fishy flavor and makes it more palatable. That is the trick with eating poi, dip something else in it and it magically becomes wonderful. You can tell the great pride owner Craig Katsuyoshi takes in his dry aged beef. Before we took a picture together, he joked about my height saying I might hit my head on his hanging beef strips. 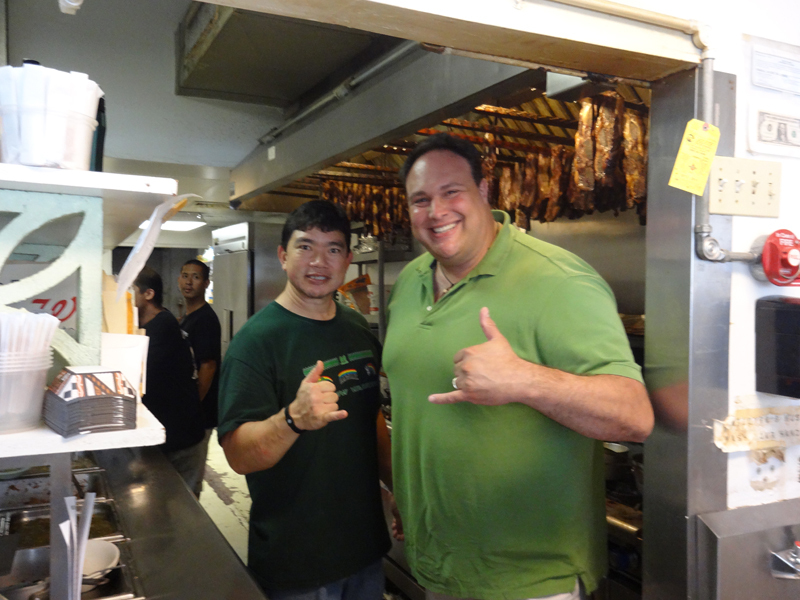 We had discussed the variety of Hawaiian specialties he serves. He was surprised how deep a mainlander went in trying items from his menu. I told him that I am a long standing Kama’aina to the Hawaiian Islands. He nodded understandingly knowing that I was just coming home for dinner.